There is agreement in the scientific community that the global food system will experience unprecedented pressure in the coming decades – demographic changes, urban growth, environmental degradation, increasing disaster risk, food price volatility, and climate change will all affect food security patterns. Climate change affects the different dimensions of food security in complex ways. The availability of food can be affected through variations in yields – especially in key producing areas – due to increasing temperatures as well as changes in the quantity of arable land and water available for agriculture. Changes in production, in turn, can affect the ability of households to access food and as such impact on dietary diversity. Moreover, changes in rainfall and temperature patterns directly impact livelihoods that depend on climate-sensitive activities, such as rain-fed agriculture and livestock rearing. Changes in the timing and availability of water may create sanitation problems and impact the quality of available drinking water, leading to increased health concerns, including diarrheal diseases. Together with other vector-borne infections, it has the potential to increase malnutrition, and affect food utilization (see page 5 of the report). Extreme weather effects also disrupt the stability of food supply as well as people’s livelihoods. high population densities in vulnerable and areas highly exposed to climate-related hazards such as floods, cyclones and droughts, and long-term climate change such as gradual changes in monsoon patterns, glacier melt and sea-level rise. This publication* reviews the current state of knowledge on the relationship between climate change and food security, focusing specifically on the Asian context, to provide an evidence base for discussion and further analysis. *Download available from the right-hand column and via the link under further resources. From page 5 of the publication: A) moving food reserves following flooding in the Democratic People’s Republic of Korea [credit: Michael Dunford]; B) people waiting to recieve food aid in Afghanistan [credit: Silke Buhr]. This report by the UN World Food Programme provides detailed background information on the diversity of ​Asia as a continent, how food security in Asia is changing, and why food security and livelihoods in Asia are sensitive to climate. The impacts of climate on the production of, access to and utilisation of food, and associated issues such as nutrition and health are described in some detail. It also describes how the climate of Asia is driven by several processes including the El Niño phenomenon, and how climate is changing and will continue to change, including details of disaster trends in Asia and how climate will impact urbans areas. Finally it provides an overview of the climate and socioeconomic trends of Asia moving forward, with emphasis on the fact that climate change does not impact food secutiry in isolation. From page 5 of the publication: The majority of productive systems in Asia are predominantly rain-fed: over 60% of agriculture in the continent depends on rainfall. Too little or too much rain often affects productivity of these crops, but can also affect livelihood stability through indirect effects on food prices, availability of nutritious food, and livelihood shocks. This map shows approximate where wheat and rice are grown – wheat is a key crop in the northern parts of South Asia and Eastern China , while rice is the main crop in Asia, contributing to most of the diets of the population; other economic crops such as sugar cane, cassava, rubber, and tea are also grown. Availability: Increases in temperature have already had impacts on crop production, and in the absence of sufficient adaptation efforts, this trend is expected to continue under a climate change scenario. Access: Variable weather patterns and extreme climate-related events could affect households’ ability to access food through increases in food prices and impact on livelihood activities. Utilization: Climatic changes can affect nutrition through impacts on food security, care practices, and health. Recent evidence suggests that climate- induced crop and livestock failure, and climate extremes are associated with negative outcomes on nutrition. One of the most significant impacts of climate change is the potential increase in food insecurity due to changes in the productivity of agricultural land, seasonal variability, and higher magnitude of disasters. Livelihoods in Asia are highly diverse as the result of rapid development and urbanization in recent years. However, rural livelihoods remain highly climate- sensitive with several households depending on rain-fed and subsistence agriculture. Climate change is a hunger risk multiplier: it interacts with the different drivers of food insecurity to create new risks (but it can also create opportunities). 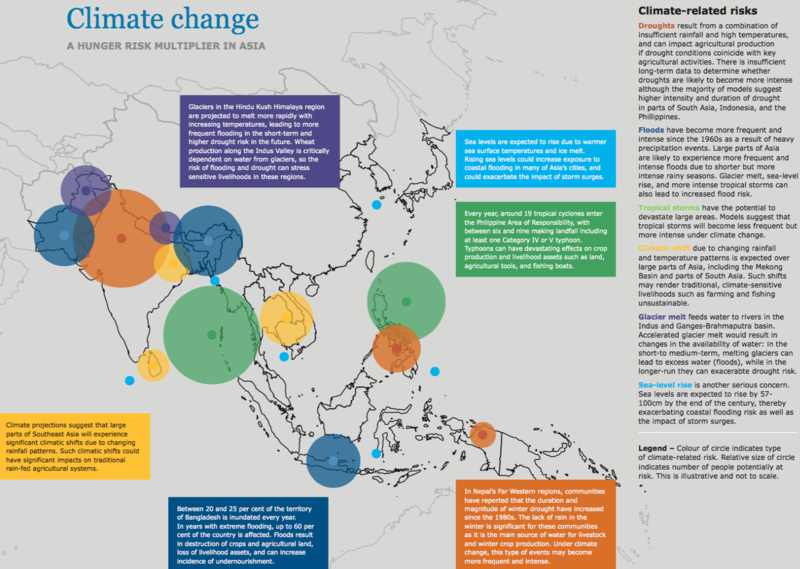 There is evidence of climate change over Asia, with temperatures increasing across most of the continent and rainfall events becoming more intense. These trends are projected to continue as a result of human-induced climate change. Changes in the seasonal rainfall patterns have also resulted in more frequent but less intense dry spells, and more intense wet spells. The timing and duration of rainfall is critical for certain agricultural activities. The magnitude of climate extremes can also have devastating effects on food security and livelihoods. Impacts associated with tropical cyclones, floods and droughts are expected to become more severe in some areas as a result of changing climate and increasing exposure. Anticipating these changes, and adapting to them, is essential to ensure food security. Climate trends do not affect food security on their own. Socioeconomic development and the adaptive capacity of populations ultimately determine the impact of climate change. As societies develop and change, so will their capacities to adapt to climate-related risks. This report has been prepared by the United Nations World Food Programme Regional Bureau for Asia, the UK Met Office Hadley Centre, and the International Water Management Institute (IWMI/CCAFS) with financial support from the Government of Sweden. Krishnamurthy, P. K., Lewis, K., Kent, C. and Aggarwal, P. (2015) Climate Impacts on Food Security and Livelihoods in Asia. UN World Food Programme.